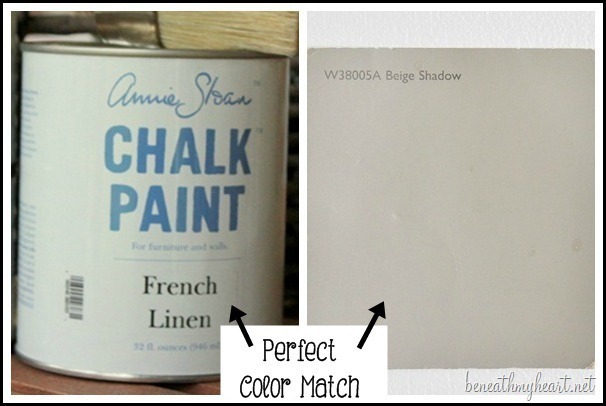 The Perfect Latex Paint Color Match to Annie Sloan’s French Linen Chalk Paint! So, I was so excited to tell you about this! Last year, when I painted my dresser/vanity with Annie Sloan Chalk Paint in French Linen, I got a LOT of questions. Mainly about the Annie Sloan Chalk Paint that I used. You loved the color of the paint, French Linen, but you weren’t sure about the chalk paint. Many of you wanted to know how to use chalk paint. Is it easy to use?, is it durable?, how do you wax it?, etc. You were also concerned with the price of the paint. It’s between $30-$40 for a quart. Ouch! I guess a lot of you had reservations about using the chalk paint, and I totally get that. But if you are more comfortable working with latex paint and love the color of the Annie Sloan French Linen, then I have good news for you! I found the PERFECT MATCH in a latex paint to Annie Sloan’s French Linen! It’s called Beige Shadow, and I found it at Lowe’s in the Waverly Home Classics section. 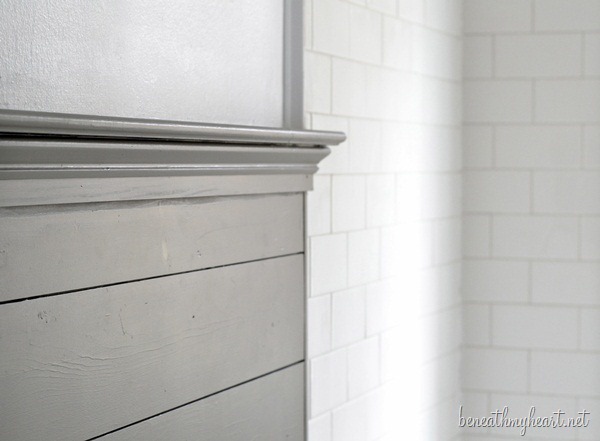 I wanted to use the same color gray on the wood plank walls in our guest bathroom renovation that I used on my dresser/vanity, but I didn’t want to use chalk paint on them. I needed a less expensive latex paint to use on the walls. So I was thrilled when I discovered this perfect match! I painted one half of this piece of wood with the Annie Sloan French Linen, and the other half of the wood with Beige Shadow. I swear you cannot tell the difference between the two except for the finish. Annie Sloan’s paint is very flat, and I got a Satin finish in Beige Shadow. That is the only difference at all. If I had gotten Beige Shadow in flat, it would be even a closer match. Soooo, if you love the color of Annie Sloan’s French Linen, but you don’t have the money or experience with chalk paint, maybe this is a better option for you! I am working on my guest bathroom reveal for tomorrow. So be sure to stop back by tomorrow to see it! « Did I Meet my 2012 Home Goals? Eggshell by Glidden which is about $12 a gallon. I painted several pieces in Eggshell first and used Minwax clear and dark wax after adding diatomaceous earth to the paint (which was basically pointless). After Hurricane Harvey flooding, I opted to salvage my upper cabinetry and purchase unfinished lower cabinets prefabricated from Lowes and decided that with the savings I would upgrade my paint selection. After many coats of Old White and after much trial and error I found that during the process, Eggshell White by Glidden is a precise match thanks to a previously painted piece which I decided to touch up with Old White…it blended perfectly! I will say that the quality of Annie Sloan’s wax isn’t comparable to Minwax but it could very well be the quality of the brush involved. I was working more with a stencil brush and a rag when I was using Minwax though recently discovered the large diameter brush by Annie Sloan brand is superb for such projects covering larger surface areas. Anyhow, technique is key it seems. Eggshell and Old White are identical as well and definitely sand and prime prior to use with Old White….the coverage and consistnacy is the same as regular flat, latex paint. The wax and brush are what makes the difference. love Freeeeench Linen. It’s a gorgeous color! Thanks for the match up! 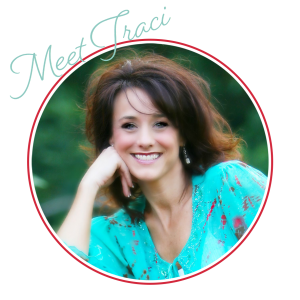 Traci, thanks for all of your inspiring ideas! Would like to paint my powder room bathroom cabinets in Waverly’s beige shadow. What would you suggest to paint over it for an antiqued look? A wood stain color perhaps? Thanks! I am flattered you like my colours but I think you might be missing the point about my paints. It seems you have not used my paint because you know it goes a very very long way. It can be used thinly as a wash, thickly or layered. It can be made to look modern or Swedish or French and chippy. It’s so adaptable and interesting. It’s not just about colour . I hope you don’t mind my comment I found though Twitter. I do not mind at all, Annie! I absolutely LOVE your paint and actually prefer it to the paint I mentioned in this post. To me, it is worth the extra cost and you are right, the paint does last forever. 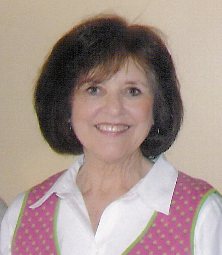 I attended one of your workshops when you were in the states, and loved working with your paints. They truly are my favorite. However, I just wanted to give my readers another choice if they preferred latex paint and needed a lower price point. Looks like you might have stepped on a toe or two, but we don’t mind because you are just trying to help those who can’t afford $40 a quart of paint!!! Ridiculous! Although I do love some of Sloan’s colors she doesn’t have me fooled!!! She has taken flat paint and done nothing but make it labor intensive!!! You are a genius to find matches and then to get it in a satin…I love it, and my clients love it! Why not lower the price on your paint…then more of us could use it!!! Genius!! Awesome and so great – thanks for sharing your find! I quite agree with Annie Sloan – latex paint is not Chalk Paint®. The color you found may be similar to French Linen, but the comparison ends there. Chalk Paint® is very versatile and can used in many creative ways. And I think you’ll find most people who actually use Chalk Paint® will tell you the cost is never an issue once you’ve tried the product. I completely agree with you. I prefer Chalk Paint above any other paint, but not everyone feels like I do. I love providing my readers with many different options when it comes to decorating their home. For ladies who are on a tighter budget, this latex paint may be a better option for them right now. I was not comparing the quality of the two paints, just the color. I just did my first ASPC project. I painted a small table (dark stain with a varnish or some kind of clear finish on top) with Duck Egg Blue. It is really true that I didn’t have to sand or prime. I used a fairly dry brush and painted it on sparingly, and I didn’t bother to go back and get good coverage on the places I missed. I wanted it to look faded and distressed. It came out very nice and I used MinWax satin Wipe-On poly for my protective topcoat because I was scared off by both the price and the process of waxing. Very pleased with the result. Just my own thoughtshere—I would splurge for the Annie Sloan on a project like this where I would otherwise need to sand & prime, but I don’t think I would use it on a wall or if painting something that wouldn’t need sanding or priming. Totally agree with you MK. I LOVE ASCP! Latex paint does NOT give you the same look and feel as chalk paint. I am only referring to the color of the paint since so many people loved my vanity when they painted it. However, many of my readers are not able to afford ASCP even if I tell them it is a better paint. I was just trying to give my readers another option if they liked that color. Sorry but I am on a fixed income so price is very important to me. If someone wants to match a paint color, can’t you take that color to a store that matches paint? I’ve taken a piece of materal to the store and they matched the color that I wanted. I am not a dummy and I know that you get what you pay for but when you can’t afford the more expensive item you must go with something you can afford and try to make it look just as good. I think that is what our crafty minds are all about. Thanks Traci for giving all of us an option and keeping it real. I agree. I feel bad people seem to be offended by you posting options. Your doing a great service. God bless you for caring for others. Some can barely afford their rent but by the being able to make their home beautiful means a lot to them. It’s really important to love your environment where u spend time with your family. I went from millions a year to less than $20000a years free a divorce of abuse. I had 3 kids. I spent hours painting and doing projects on the clearance paints at lowes. People shouldnt be so quick to complain about your posts or what your trying to do. What seems silly to one means the world to someone else. Thanks for doing the homework for us, Traci. It’s kind of hard to match a color if you don’t already have that color! :) I love milk paints, which are almost as expensive as chalk paint, but I wouldn’t consider spending that much to paint a large area like my walls. Latex paints certainly shouldn’t be considered inferior, just different. Like you said, we all have our budgets to keep in mind. I love the look of Annie Sloan chalk paint but it is soooo expensive! I found a great “chalk paint” recipe on Pinterest and every project I’ve done with it so far has come out beautifully! Now that you’ve provided the color match….we have a DIY project in the making! Ann…what was the recipe that worked for you? I will be buying ASCP based on your recommendation. ASCP will be used for pieces that I want to really spotlight/standout. I realize that a little goes a long way and I am sure I will get all of the items I want to use it on done, but I need me some latex paint too! So thanks for the color match service and a great review. I LOVE YOUR SITE! Thank you so much, Mary! I think you will love the Beige Shadow. It looks great on my wood walls. I still have my ASCP too, and will enjoy using it on my favorite furniture pieces. Thanks for the color match Traci. I have used ASCP as well and love it for furniture, etc. But, when I need to paint large areas such as walls in a kitchen or bathroom (or even the exterior of a house), I will need to defer to latex. Thanks for providing your readers with both options. That’s what a girl wants…options. You are welcome, Brit! Love you girl! I actually just commented to say Hi and saw that you’ve got quite a discussion going on here, my friend! :). I loooove ASCP too and have had such fun experimenting with it. Just wanted to let you know that I’m back blogging again and soo excited! Hope to talk to you soon! Traci, thanks for sharing the information about the different options in painting furniture and walls. I generally choose better quality products for furniture that will be used ALOT. I do the same for walls. For instance if I am painting the inside of a closet….I definitely use budget paints. Furniture that will see lots of use would be well suited for The Annie Sloan product. 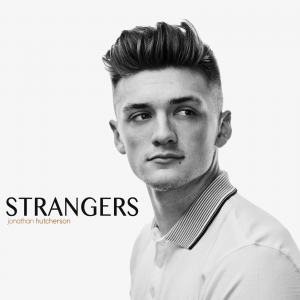 as you know I LOVE your blog and look forward to seeing your posts. That’s cool that SW will do that, Melissa! Awesome! Thanks for stopping by, sweet friend! Sherwin Williams has great customer service and great quality paint. We used their paint to repaint our entire 5000 sq ft house just before putting it on the market. We used coupons to get the price down, but the quality was fabulous and the sales people were great with matching colors, helping me in many ways. Always nice to have options. Looking forward to seeing your reveal!!! As one person posted earlier – “THANK FOR KEEPING IT REAL!” AMEN! Thank you for the color tip. I’ll take a look at it when I get to lowe’s. I agree cost, time and I’m older and will have to paint the rooms by myself. I like the idea of chalk paint and the waxes, but these will be walls. Large living room and hall, I too am on a fixed income. Lowes sent me a $10.00 coupon to use off a $50.00 purchase. That might just help me with the cost of the room. Thanks again. God Bless. I am one that just can not afford the ASCP. I would much rather spend $40 on clothes for my kids. Maybe in the future I will be abe to afford it :) I really appreciate this post. Thanks! I appreciate how professional you were in response to those critics, especially “Annie Sloan” herself. 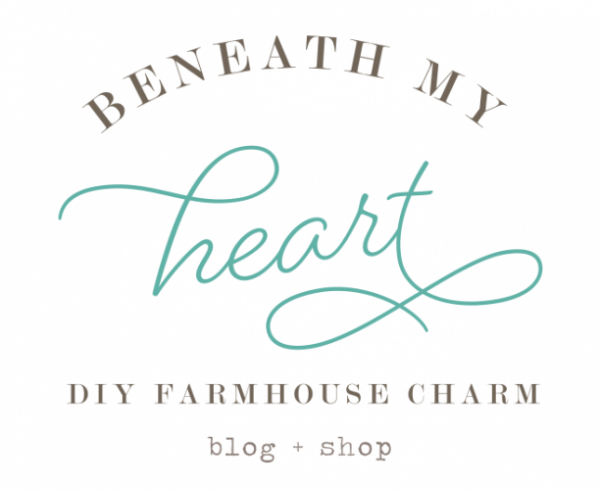 The chalk paint she offers is amazing and would be great if everyone could afford it. Maybe one day she will see fit to offer the paint at a more reasonable price tag. I LOVE that you were kind enough to offer a color match solution if we were looking for the color (not just the texture – which does look fab in ASPC). I think what bothers me the most is that she didn’t even care to look at the picture attached to the post showing you HAD used the paint. Guess what, Annie Sloan? You’ve lost a potential customer because of your post. You should absolutely take pride in your work and point out all the versatile uses. But read the entire post / several blog entries and know this woman raves about your products all the time! In fact, you should offer her FREE product for all the advertising she has done!! I cant seem to locate that color for French linen by Waverly home Classics at Lowes??? Is there another name for it? Thank you so much for this info! I don’t think this color is available at Home Depot is it? The list was updated in 2015, I hope that you will find it useful! PS the French Linen color matched up with Behr is Gray Squirrel! I got it at Lowe’s, but Home Depot can probably “color match” it. I am incredibly appalled by Annie Sloan’s comment, as well as the other clearly P.R.-driven related responses. Definitely won’t be using her products based on that alone. It’s a shame when someone can’t simply share a similarity in color without a business getting defensive. This is a rather other post that I stumbled upon and felt compelles to leave a comment. Thanks for keeping it real, Traci! I agree it was obvious and bad form that Annie Sloan didn’t bother to read the entire post. Sadly she missed you bragging about how lovely her paint is. She should take pride in the fact that people love her colors so much they went to the trouble of color matching. Imitation is the highest form of flattery as once a very wise man stated. She should also be aware that using chalk paints to paint a wall would be very expensive and a PIA since it has to be sealed or it won’t be stain proof or washable. Her wall/floor sealents are pricey too and many people don’t want to spend that kind of effort or money just to paint a wall even if they can afford it. It’ clear that A.S. completely missed the purpose of your post. Keep up the hard work because all of us “normal” people appreciate it. Is this a grey color or more of a beige? I too have used Annie Sloan paint, but it is waaay to expensive. I enjoyed the reply earlier to Annie herself on why she doesn’t lower her price. I noticed she didn’t answer. Thank you so much Traci for giving these color matches! Add mixture to 1 cup of (flat or satin) latex paint and you will have a very nice, chalky paint. You can also use Plaster of Paris in the same ratios. It’s much easier to get, but not nearly as environmentally friendly. If Annie Sloan would like us to use her paint instead of trying to find alternatives, she needs to make it more affordable and more accessible. If someone loves this color and wants to paint their entire home with it, of course they aren’t going to use ASCP! Thanks for the great tip on the color match!